Sio Moore knows he’s been lucky on many levels. Lucky to be contributing to the UConn football team as a redshirt freshman linebacker. Lucky to be majoring in resource economics. Lucky to have dodged a bullet aimed at his head. Five years ago, Moore was an impressionable 14-year old. Born in Liberia, his family moved to the U.S. shortly after his birth to escape an escalating civil war, soon settling in West Haven. Moore had potential as a football player. But he wasn’t exactly a model student or citizen. One night, he says he was lingering around after a late-night party had been shut down. Gunshots were fired. He took off running, only to hear more shots ring out behind him. He decided a change was necessary. It would begin with a new environment. He phoned his sister, Tiplah, older by 19 years, in Apex, N.C., and asked to move in with her family. Living with Tiplah and Grady Broadnax gave Moore the basis to change his life. He developed into a major college football prospect, but also a student with goals beyond football. 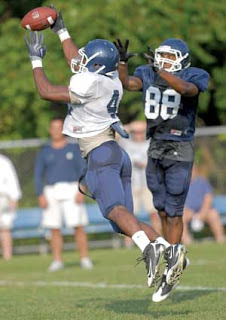 In the summer of 2007, not long after finishing his junior year of high school, Moore accepted a scholarship to UConn. He briefly toyed with the idea of returning to live with his mother and attend West Haven High, but ultimately returned to Apex. Since arriving in Storrs last summer, Moore has gotten bigger and stronger. He’s added over 20 pounds of muscle, and increased his bench press from 300 to 370 pounds. He also had the luxury of learning to play linebacker by watching the Huskies’ talented starting crew of Scott Lutrus, Lawrence Wilson and Greg Lloyd. Still raw, Moore has shown flashes of brilliance in his brief career. He was named scout team player of the week four times in the fall. At the annual Blue-White Spring Game in April, Moore registered a game-high 17 tackles. UConn coach Randy Edsall bumped Moore up to backup weakside linebacker behind junior Lawrence Wilson, himself a Freshman All-America in 2007. Moore has continued to impress during preseason camp. On Thursday, the second of two practices in 95-degree August heat, he intercepted a pass and returned it for a touchdown during a live scrimmage. But afterward, Moore could only think about the plays he didn’t make. “It’s nice to have one, but I should have had three,” he said, shaking his head. Moore is being hard on himself. It’s a trickle down effect. Edsall has been pushing him all preseason. Moore has otherworldly ability, but is still learning the nuances of the position. Moore’s main contribution this fall will begin with special teams, where Edsall has him involved in all facets. The screaming from Edsall, and he’s heard plenty over the last three weeks, doesn’t bother Moore in the least. Moore also has a post-football plan in place. Sort of. UConn media hard at work.